I am Tam Lawrence the publisher of Exposure Magazine and I live with R.A. It is rheumatoid arthritis, the body’s immune system attacks its own tissue, including joints. In severe cases, it attacks internal organs. Rheumatoid arthritis affects joint linings, causing painful swelling. Over long periods of time, the inflammation associated with rheumatoid arthritis can cause bone erosion and joint deformity. such as ginger, turmeric, lemons, and apple cider vinegar. I recently, started watching Dr. Gundry’s videos and reading over his emails. Dr. Gundry’s emails and videos [along with my faith] have given me a sense of hope. I guess hope that one day I will wake up pain free. Currently, I live with an undesirable guest in my body. My primary physician is crazy he wants to feed me drugs that will negatively impact other organs in my body. However, the normal R.A. blood levels should be lower than 40 my R.A. level is at 331+ doctors say I should be in an overwhelming amount of pain. As a result, I have given my undesirable guest R.A. an eviction notice with the use of natural herbs and following Dr. Gundry’s recommendations. To share with you some health tips. I included an email I received from Dr. Gundry today. I hope this helps you stay healthy. Thanks for reading 🙂 Smile together we’re winning! Dr. Gundry here with something special for you: a tasty, simple, and healthy recipe right out of my first book Dr. Gundry’s Diet Evolution. Today’s recipe features one of my very favorite proteins: steak. Surprised? I get it. Many of my patients were shocked to hear a cardiologist recommending a steak recipe! Rule #1: Eat only the correct serving size. This is easy. A serving of meat — whether it’s beef, lamb or fish — should be no more than 4 oz (about the size of the palm of your hand). Rule #2: Eat only grass-fed beef. For most of human history, our ancestors only ate beef from animals raised on grass. Why? Because cows are designed to eat grass. But over the past 100 years, there’s been a major shift in our diet – and we’re just now starting to feel the impact of it. “Big Agriculture” started feeding livestock with grains to save money and increase production, but we’re the ones paying the price with our health. Grass-fed beef has a natural, balanced ratio of omega-6 fats to omega-3 fats — the ratio is about 3:1, which is perfect. But when your ratio is any higher than 4:1, you start getting serious health problems: Heart disease, hypertension, arthritis, and more. And the fact is, modern, grain-fed beef can have a ratio of 20:1 or even higher! Grain-fed beef is deficient in healthy omega-3s but it’s loaded with omega-6s, which are extremely unhealthy at these high levels. Grass-fed beef is healthier, it’s leaner, and it tastes better… I tell my patients to switch to grass-fed beef exclusively. However, it is more expensive than grain-fed beef, and that’s where my recipe today for Chipotle Flank Steak comes in handy. Flank steak is as tasty and tender as a ribeye or strip steak, but often a third of the price — or even less. 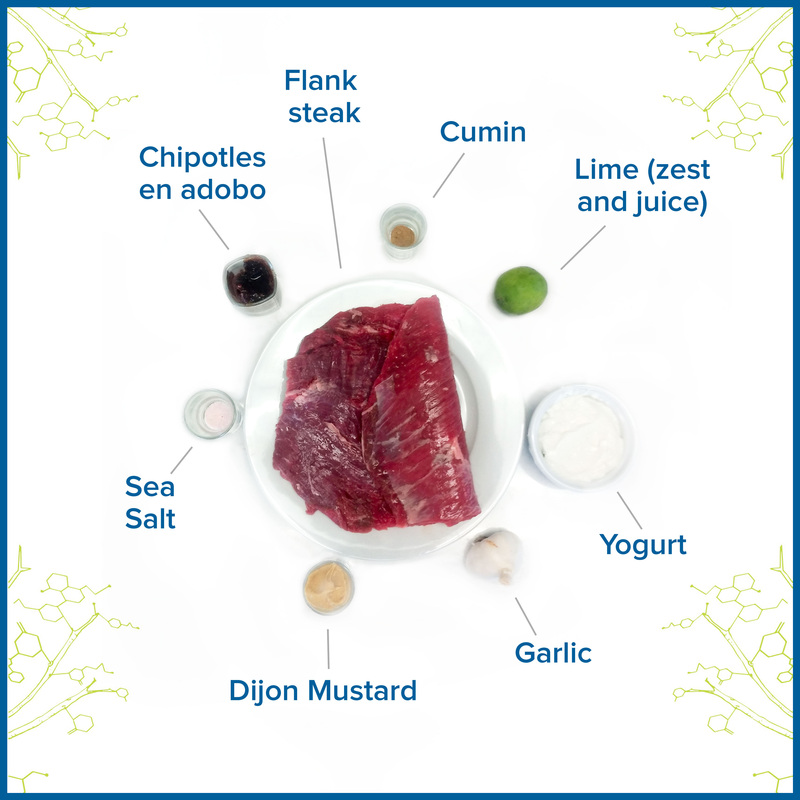 And by adding one tenderizing ingredient to the marinade — goat’s milk yogurt — you’ll end up with the most succulent flank steak you’ve ever eaten. Combine all ingredients except the steak and sea salt in a resealable zip-top plastic bag. Seal bag and shake to mix well. Add steak and press air out of the bag, making sure the meat is well coated in marinade. Let marinate AT LEAST one hour, or as long as 8. Preheat a grill or skillet over high heat. Remove steak from marinade, pat dry, and sprinkle with salt. Grill to desired doneness — medium rare is about 4 minutes per side — and let rest for 5 minutes before serving. Slice steak against the grain into thin, diagonal slices. Serve 4 oz of meat per person. And there’s your steak! Now, the best thing about this particular recipe is its versatility. Since you’re making a larger piece to start, you’re sure to have plenty of leftovers… and since this recipe tastes good hot OR cold, it’s as nice on a salad as it is hot. 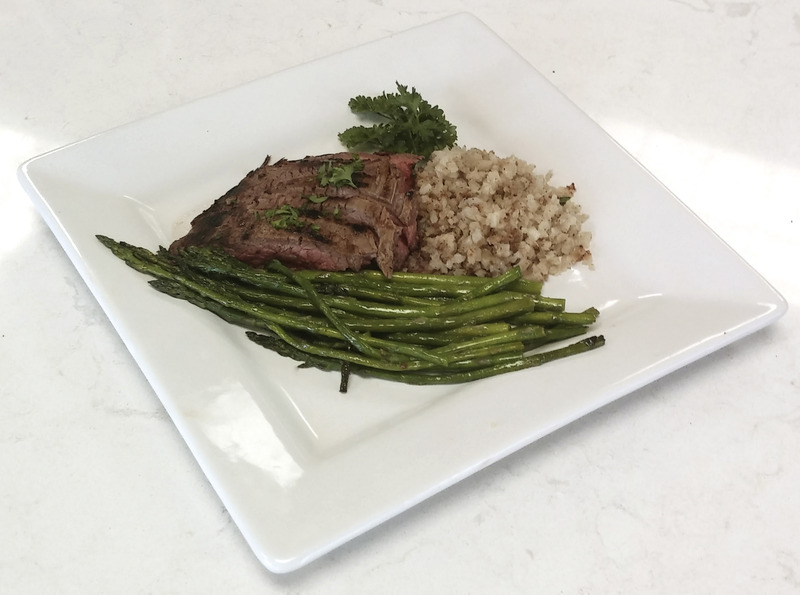 For a simple weeknight meal, I love to serve my steak over a bed of riced cauliflower, along with grilled asparagus (with a healthy drizzle of olive oil, of course!). Creamed spinach — sauté spinach with garlic until wilted, then remove from heat and stir in cream cheese, salt and pepper, and a dash of nutmeg for the EASIEST creamed spinach. There’s a reason you see some variation of a steak salad on almost EVERY restaurant menu: It’s a classic. 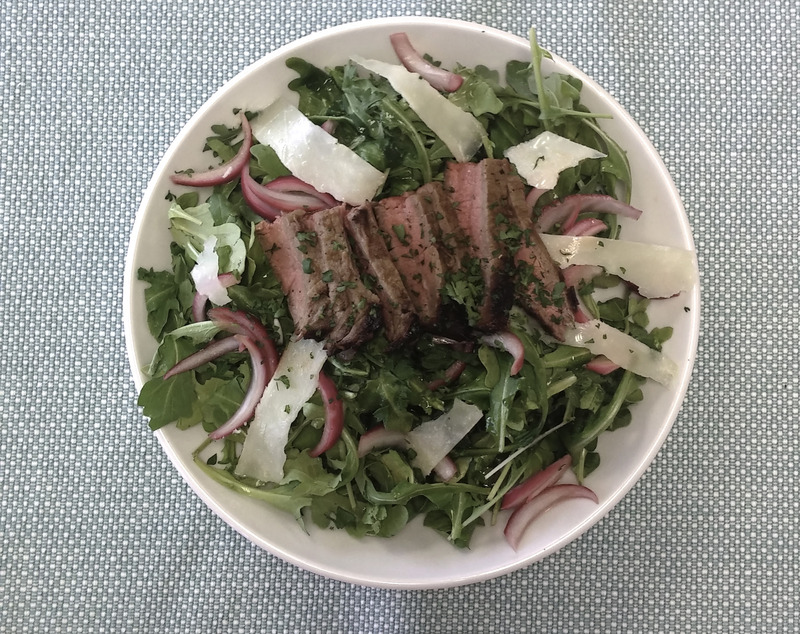 My favorite steak salad features peppery arugula, shaved pecorino cheese (just a little bit), pickled red onion, and a sprinkle of parsley. After all, when you’re starting with a perfectly cooked steak, it doesn’t take much to make a fantastic salad. And I keep the dressing simple too — just a mixture of red wine vinegar, lemon, and extra virgin olive oil. In your opinion, what’s the hardest part about trying to eat healthy? I’ll read through your answers and come up with easy solutions for the most common problems – so please reply to this email and give me your input!